My favourite season a.k.a winter is slowly approaching and I couldn't be happier. The cosy feel of winters, the beverages, and snuggling in the blanket and catching movies/reading books are a few things that I like to indulge in to enjoy the season completely! However, there's a grey character in this happy tale, which unfortunately goes by the name of dry skin and dry lips. Although my skin remains dry throughout the year, but the things go on another level when chill hits the air. To tackle the menace, I love me a bar of a moisturising handmade soap alongside body butters/oils. In this post, I will be sharing my experience with Castile Soap that comes from the house of Nature's Destiny. The brand is headed by Mrs Aishwarya Ravi which is based at Chennai, Tamil Nadu and handcrafts cold processed soaps, natural detergents, shaving balm etc. Every time we see something new, we wonder, "how did this all start?" "what is the story behind their origins?". Well, we wouldn't be able to assuage your every curiosity, but we could tell you how we came into being. Two words - love and determination. A mother's all encompassing love for the tiny soul she created and vowed to protect and cherish, and her determination to see these vows through. Before we started out, there were enough baby products available on the racks, but all of them contained that dreaded component - "chemicals". The other organic options available were very limited. So, we did the next best thing we could; create the safest, softest and most natural baby products.Then we thought, "Why stop here? Why not let every other mother out there, benefit from what we have created"? And that's how friends "Nature's Destiny" happened. At this phase, we are now catering to more than just the tots. We offer a wide variety of products for children, women and men. Do join us on this wonderful journey and be a part of something natural and beautiful. 100% Olive Oil, Sodium Hydroxide, Distilled Water. 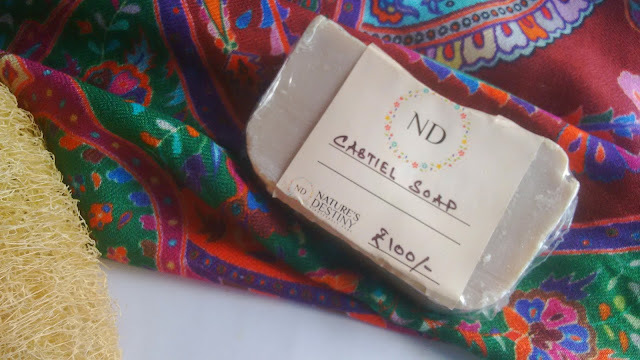 Castile Soap had been on my wishlist for a long time and when I saw Nature's Destiny offering it, purchased it immediately without any second thoughts. 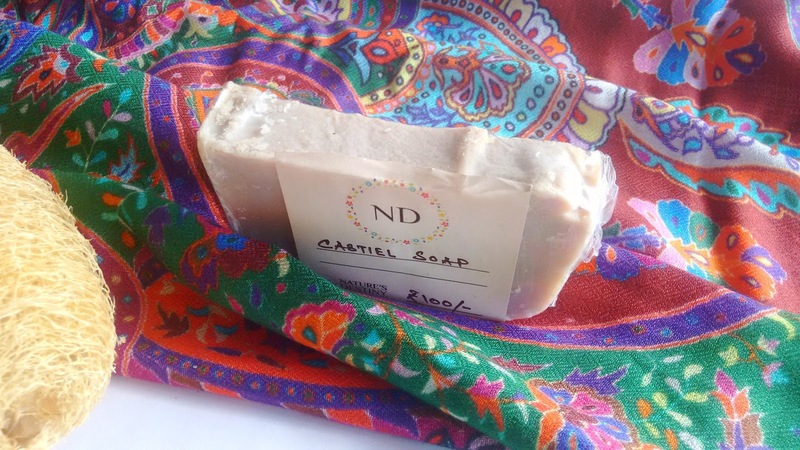 Castile Soap has been used for centuries to treat skin ailments like eczema, psoriasis, dermatitis. A pure Castile Soap is made using 100% olive oil which won't cause irritation and clog pores as a natural soap provides deep cleaning. Nature's Destiny is a very simple looking bar with no scent which is the best part about it. The bar is made using olive oil and is free from artificial fragrances, cheap chemicals, and fillers, which makes it very gentle for all skin types as well as babies and children. It lathers mildly and moisturises my skin, making it smooth and squeaky clean. Besides, olive oil is known to possess skin-softening benefits since the ancient times. I could not do without applying a body moisturiser because my skin is very dry. But people with oily to normal skin would not need to follow up with a moisturiser. Since olive oil is a "soft oil", the soap bar tends to melt quickly, even when dried between uses. Olive oil is a natural source of Vitamins A and E, which fight free radicals that our skin is exposed to through food, pollution, commercial beauty products etc. on a daily basis. Cut the full sized soap bars into to pieces to make it handier for use, and last longer. To keep the soaps dry between uses, keep them in water draining soap dish with slots or holes. Made of 100% olive oil. Safe for babies and children. Olive oil contains Vitamins A & E which fight free radicals. Olive oil is known to soften skin. Cleanses the skin gently without clogging pores. Prolonged use makes the skin smooth. Fights skin ailments like eczema, dermatitis. Since olive oil is a "soft oil", the bar melts quickly even when dried between uses. The soap bar costs INR 100 for a 100 gm bar. It can be purchased from brand's official Facebook page HERE. I totally would! The soap is pure and made using 100% olive oil which makes it great for all skin types. Switching to all natural handmade soaps has been a blessing for both me and Samra so I would recommend if you are someone who uses commercial soaps pick this soap bar up this winter and feel the difference (re: magic)! The next on my list is Bastille Soap from the same brand. Have any of you used Castile Soap? If so, what has your experience been like? Disclosure: The product featured in this post is my own purchase and the views expressed hereby are strictly unbiased, based on my personal experience.